In celebration of its Oscar nominations we’ve been sent over a great infographic that shows the NWA family tree. It’s amazing what the band members have gone onto do. That’s just in the music industry. Our sister site gave the film, Straight Outta Compton, 5 stars. Not only were they a great band, they have a great story behind their songs. 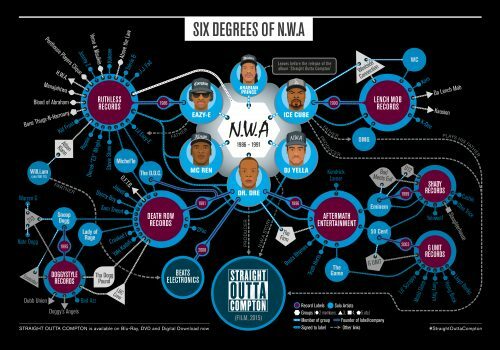 Beginning with the 6 original N.W.A members – Eazy-E, Ice Cube, Dr Dre, MC Ren, DJ Yella and Arabian Prince – the infographic branches out to show the wealth of record labels, artists and enterprises that went on to become associated with the band, including Death Row Records, Aftermath Entertainment, Eminem, 2Pac, Busta Rhymes, Kendrick Lamar, Beats Electronics and many more, culminating in the movie release of Straight Outta Compton. You can also download the above infographic as a pdf. Aldis Hodge, Corey Hawkins, DJ Yella, Dr. Dre, Eazy-E, F. Gary Gray, Ice Cube, Jason Mitchell, MC Ren, Neil Brown Jr, NWA, O'Shea Jackson Jr.